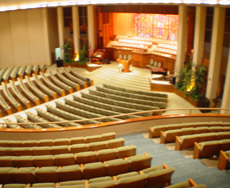 Renowned architect Paul Williams’ circular design for Founder’s Church symbolizes the wholeness, unity, unending and all-inclusive power of love basic to Science of Mind teachings. Weddings - A center aisle and understated lighting create an aura of love for small to medium sized weddings. Christenings – The ministerial staff of the church is available to members and friends of Founder’s who desire to have a child christened as recognition of Spirit’s indwelling presence and testament to a family’s commitment to providing the child spiritual guidance and encouragement. For information, contact Ann Doherty at 213 388-9733. 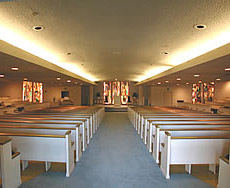 Funerals and Memorial Services – An intimate setting for sharing memories; Hornaday Hall is immediately adjacent for repasts. Meetings & Lectures - The Chapel’s special ambiance enhances any gathering, sacred or secular meetings, poetry readings, book signings, etc. 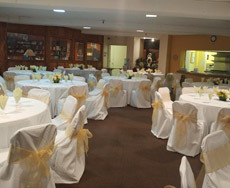 This large multi-purpose space connects directly to Founder’s fully-equipped kitchen and can be booked for events in conjunction with the chapel such as, repasts, receptions and christening parties, or it can be rented individually for luncheons, dinners, parties, classes, presentations and group meetings such as Toastmasters and Alcoholic Anonymous. 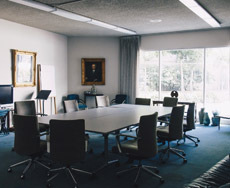 A smaller space than Hornaday Hall, Armor Lounge is available for meetings and/or classes of up to 50 persons.